The Fitnex B70 upright exercise bike goes for about $1200 on sale, although the list price is over $1400. Labeled as "commercial grade," it's an extremely rugged, quiet exercise bike for in-home users. The console combines matrix and LED readouts with all of the feedback you need for a good workout, including time, workout level, watts generated, speed, pulse, metabolic equivalent (METS) and calories burned. It offers 16 magnetic resistance levels. Max User capacity: 400 lbs. Dimensions/Weight: 42"L x 23"W x 55"H; 117 lbs. Check out the Fitnex B70 Upright Bike on Sale at Amazon Now! Once again, Fitnex has produced a stylish exercise bike that gives owners more than enough variation to satisfy typical users. 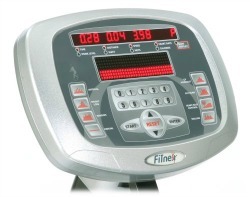 The Fitnex B70 is part of FMI's line-up of exercise bikes crafted from quality parts for flawless, in-home assembly. The 16 levels of resistance can be adjusted smoothly using the oversized matrix/LED console. There aren't many reviews for the B70 upright bike, but the ones we found rave about this bike, which is pretty impressive because the majority of people shopping for an exercise bike have never heard of Fitnex, despite their history of producing well-crafted machines that wear like iron. Reviews often mention the self-generating power that requires the user to keep pedalling in order to use the console. It's a brilliant little "carrot and stick" feature that will motivate users to keep going. The cushioned seat is ergonomically designed to prevent fatigue and was of particular interest to reviewers who used the B70 as a training tool for real-world cycling. 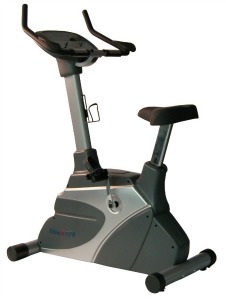 The manufacturer touts the Fitnex B70 upright exercise bike as their commercial grade offering for in-home use. Interestingly, the warranty lists as lifetime on frame and 5 years on parts with the caveat that it's meant for in-home use only. Despite that, we like the stability and extremely quiet ride of the B70. You'll feel secure and comfortable even when you're pushing the envelope on speed and resistance. You can order the B70 online from retailers such as Amazon, where you'll often find a good deal. Fitnex doesn't sell their products directly to the consumer, but with Amazon and others offering great deals any time of the year, the lack of factory direct purchasing isn't much of an issue. According to the reviews, the Fitnex B70 upright exercise bike is easy to assemble with individual pieces that are always finely machined for perfect alignment. It's safe to say that the easy assembly in this case is due to the company's attention to detail. That same attention should keep this machine performing flawlessly for years.